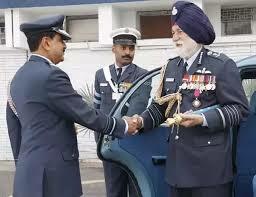 The Prime Minister, Narendra Modi has condoled the demise of Marshal of the Indian Air Force Arjan Singh.In a series of tweets from his twitter handle the Prime Minister said that the Marshal of the IAF Arjan Singh’s determined focus on capacity building in the IAF added great strength to our defence capabilities. Calling him a distinguished air warrior and a fine human the Prime Minister extended his thoughts to his family and those mourning his unfortunate demise.India mourns the unfortunate demise of Marshal of the Indian Air Force Arjan Singh. We remember his outstanding service to the nation. Marshal of the IAF Arjan Singh’s determined focus on capacity building in the IAF added great strength to our defence capabilities. Sometime back I met him, who despite his ill health tried to get up to salute even though I said no. Such was his soldier discipline. My thoughts are with his family and those mourning the demise of a distinguished air warrior and fine human, Marshal of the IAF Arjan Singh. RIP”, the Prime Minister said.